Origin: This breed, the Old German Owl, is the originator of the short faced German Shield Owls. The breed was again formally recognized in Germany in 1956, but the first official standard was not adopted in Europe until 1960. 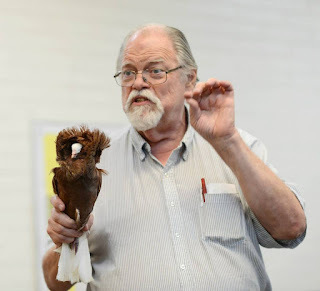 The Old German Owl Club adopted this standard in 1998, and it was subsequently adopted by the National Pigeon Association of America in 1999. No revisions have been made to date. 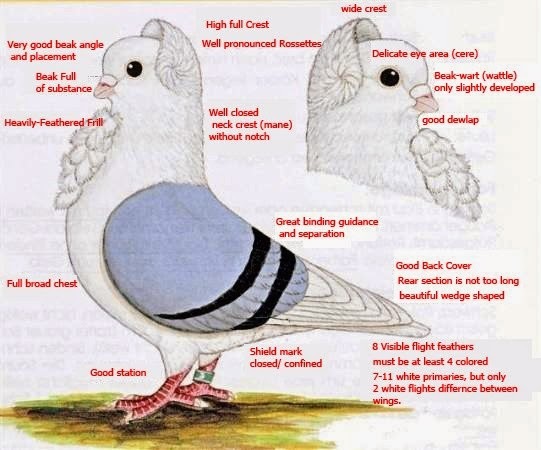 General Characteristics: Medium sized, compact, charming, gentle, active pigeon with a distinct owl character. 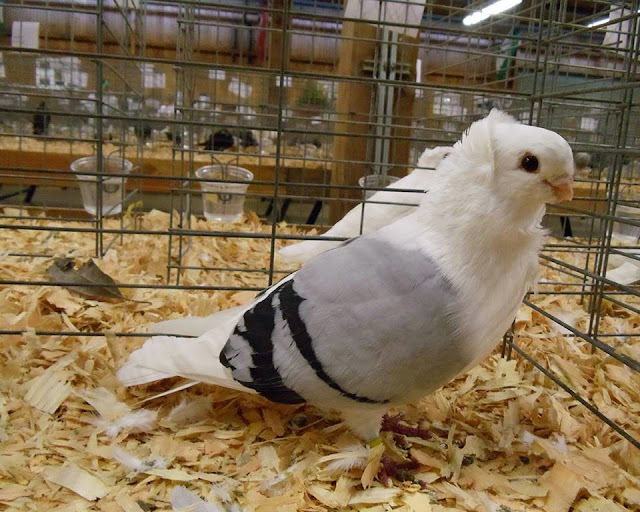 The breed has a medium sized beak, nearly rounded head, and well developed frill. It is found in self, shield, and tail-marked varieties. Head: Nearly round, broad, with a well arched forehead and a small full shell crest, closing with rosettes. Eyes: Large, bright and lively bull eyes. 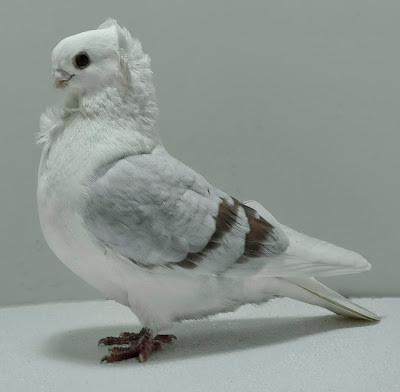 Cere is light and delicate. Beak: Medium length, broad, light flesh color, making an obtuse angle with the forehead. The wattle is small and undeveloped. Neck: Short, stocky, held proudly, slanting slightly backwards and upright. The throat has a slight dewlap and a well developed frill. Breast: Broad, well rounded and held forward prominently. Back: Broad in the shoulders, becoming narrower toward the tail, and sloping downward. Wings: Strong, lying close to the body, covering the back, and resting on the tail. Tail: Held tightly together, as short as possible. Legs: Short, shanks are scarcely visible. The feet and toes are never feathered. 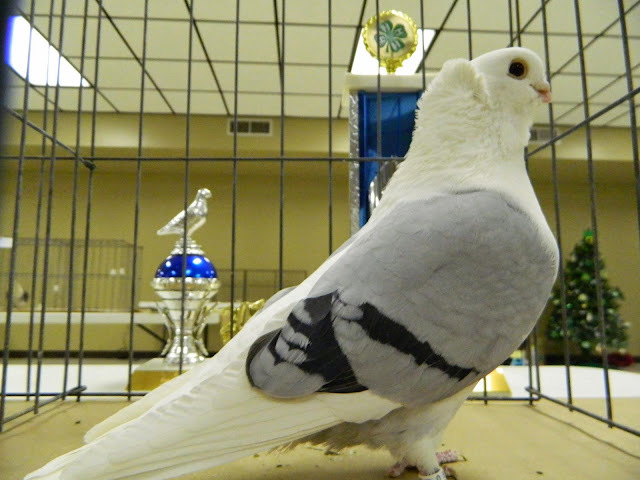 Feathers: Well developed, lying tightly against the body. Current Available Colors and Patterns: Blue, ash red, recessive red, brown, spread, checks, and bars in black, red, brown and white and dilutes of these base colors. Self white and red. Colors and Markings: All colors are to be as smooth, clear, and saturated as possible. 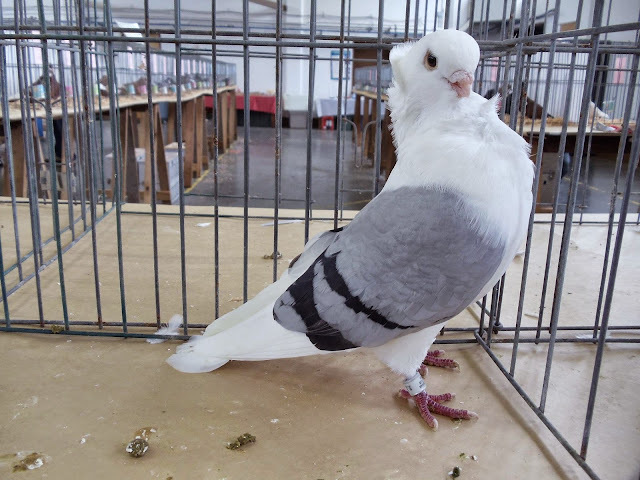 The body color is pure white. The shield marked variety ideally has 10 white flight feathers with colored thumb feathers. 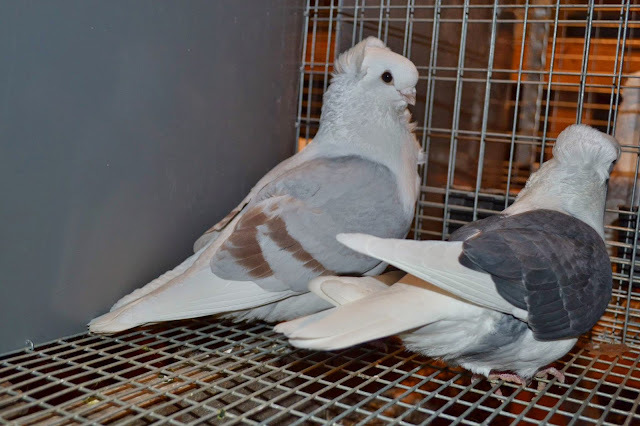 The tail marked variety is pure white except for the colored tail feathers which include a wedge-shaped portion of the back and body under the tail.